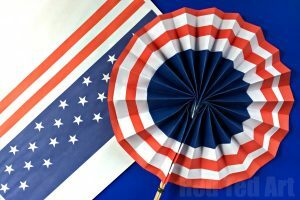 Oh yes, it is that time of year, as Summer draws closer it is time for some wonderful Patriotic Crafts to celebrate 4th July Crafts. 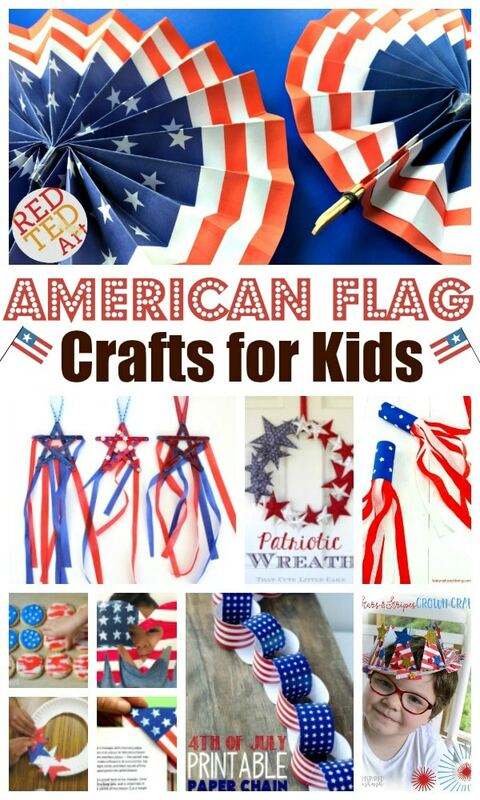 What better way than with a meddly of American Flag Crafts for Kids (and more..). 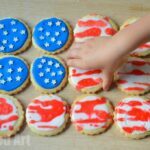 If you are looking for some fun and easy craft projects for 4th July, I do hope you will enjoy the collection I have for you today.. From easy American Flag Cookies (use store bought cookies if you wish!) to printable Patriotic Paper Fans. 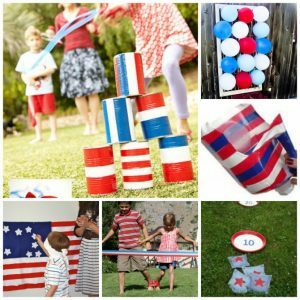 Lots of wonderful 4th July Decorations and even some game ideas!!!! 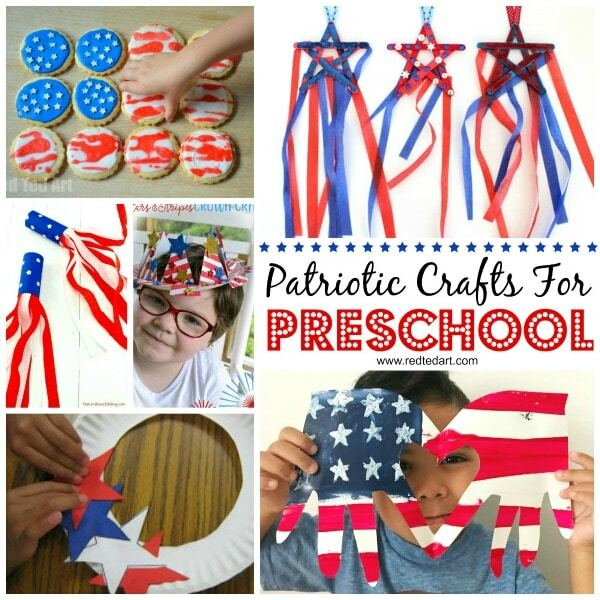 I have labelled this section Patriotic crafts for preschoolers.. Of course, older kids and grown ups can enjoy these ideas too!! 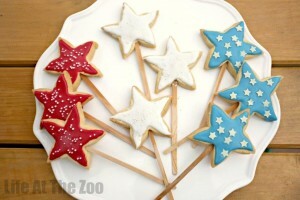 Especially the oh so easy and fabulous looking 4th July Cookies!! I am forever “just” trying to order things for you for easier browsing! These Easy 4th July Cookies are some of our favourite cookies ever. We used our favourite no egg sugar cookie recipe to make them, however you can use plain store bought cookies too for “speed”.. making these a great fun activity at a 4th July Party or play date! Preschoolers will love our Rocking Paper Plate Series. 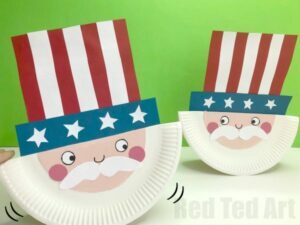 We can’t have a series without a patriotic paper plate craft.. right? 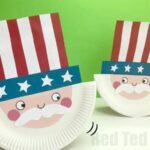 Take a look at our super fun and quick to make Rocking Paper Plate Uncle Sam Craft for Preschoolers! Uncle Sam really does ROCK!!! Adorable Handprint Flag Day Craft for Preschool by Happy Craft on YouTube! These are wonderful for Memorial Day too! 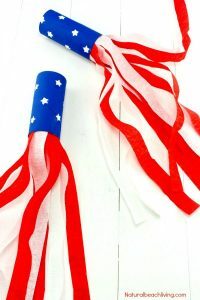 Memorial Day Paper Tube Streamers.. oh which child wouldn’t love this fun and easy craft.. you can use them as “blowers” or hang them up as wind catchers. So fun and easy to make. Full info over on Natural Beach Living. 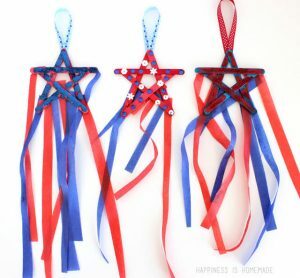 Or how about some gorgeous Craft Stick Stars as a lovely 4th July Decoration? so cute! Visit Happiness Homemade for more info! 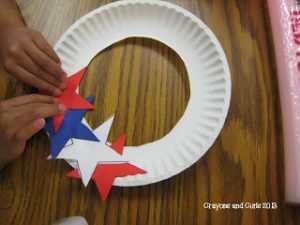 Easy Paper Plate Star Wreath for Preschoolers by Crayons and Curls! How cute and of course super easy for small hands to manage! 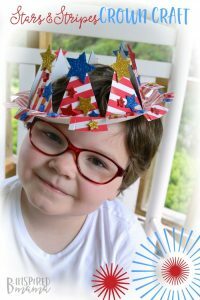 Super easy Paper Plate Crown in patriotic colours by B-Inspired Mama! 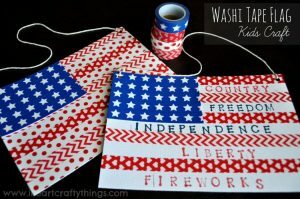 Fun with Washi Tape for 4th July – make gorgeous Washi Tape Flags with I Heart Crafty Things! 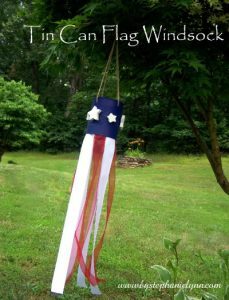 And another great American Flag Idea for kids by I Heart Crafty Things. 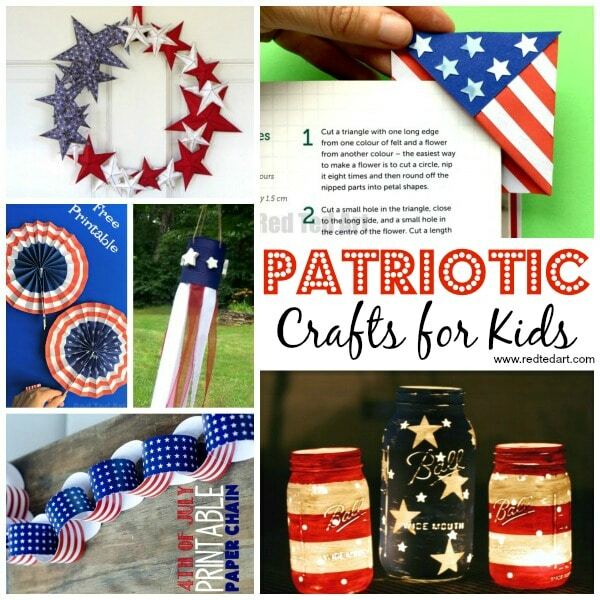 Though I have created a section for patriotic crafts “for kids”… many preschoolers would still enjoy these crafts but may need a little assitance. Maybe older siblings could work together with younger ones? 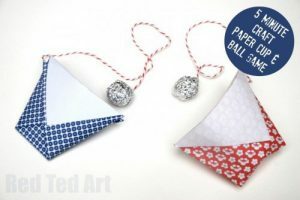 I particularly love the Paper Flag Crafts – perfect as a Flag Day Craft idea!!! 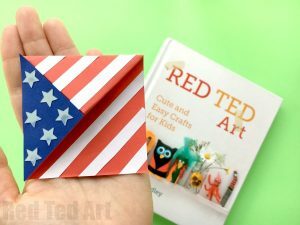 No Red Ted Art collection of crafts would be complete with out a Corner Bookmark.. we really do have a Bookmark for EVERY occassion and today’s American Flag round up is no exception.. check out our easy American Flag Corner Bookmarks – they make great little gifts for 4th July! 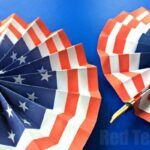 These Patriotic Paper Fans are super fun and easy to make – make them from scratch with blue, red and white paper OR use our handy stars and stripes printables – whatever suits you more! 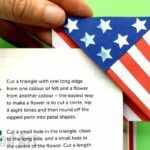 And whilst we are on the topic of Paper American Flag Crafts for kids.. how is this American Flag Quiz? 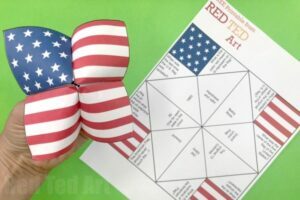 It is a Quiz and American Flag Cootie Catcer Printable in one. 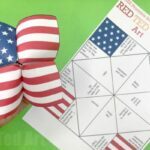 Choose from two printables – a plain flag to add your own questions, or a pre printed question Cootie Catcher! 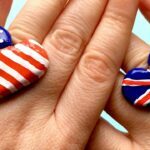 Next up we have these Polymer Clay Flag DIY Rings.. these are a great DIY for Tweens or teens! Ok, so we had cookies further up.. and these probably are JUST as easy as the ones made earlier… but hey they have an extra little step.. as they are Star Cookie Pops! The perfect 4th July Star Cookies! Next up, we have this great Star Easy Origami Wreath – it looks tricky, but I promise you, the basic shape is easy to make and a great intoduction to Origami for kids! And we all know that doing origami with kids has huge benefits! 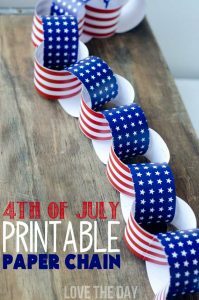 And adore these Printable 4th July Paper Chian by Love the Day! 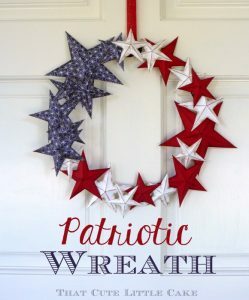 Some of these crafts shared here are not in the “traditional” patriotic colours.. however, I thought they would still be useful to include in this collection of American Flag Crafts and 4th July Crafs, as in a different colour scheme they would still be perfect – e.g. the Origami Stars shared below – make them in red, white and blue and they would look fabulous! 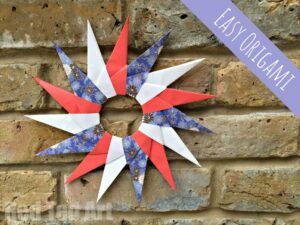 Yep as mentioned.. these Origami Stars would look wonderful in Patriotic Colours and are a great way to decorate for a 4th July Party! Or how about a little Paper Cup Ball Game? 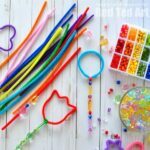 Quick and easy to make and hours of fun to play with! 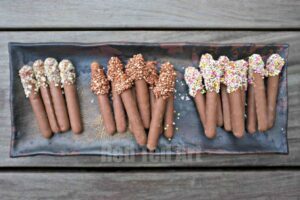 Use popping candy to make these edible sparklers.. another little treat to make for a 4th July Party with kids! 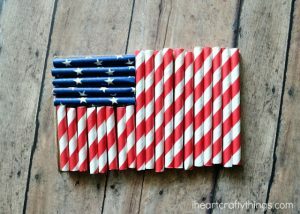 And just a handful of other 4th Of July Crafts from other websites.. I am sure you will love them too! Wonderfully effective Patriotic Mason Jars by Addicted 2 DIY. Don’t they look amazing? Love the stars and stripes! Wonderful distressed Paper Star weath via Catch My Party. Check out the step by step how to for this wonderful wreath DIY. 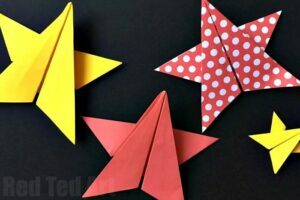 You may also want to check out our method for making quick paper stars (I think it is a littl easier than theirs!) then come back to see how to distress them and assemble them! 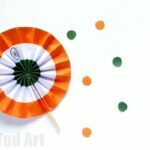 Tin Can Windsock via Fun Crafts Kids!